Home » World » USA & Canada » Bombs Explode at Boston Marathon Finish Line 2 Dead, 100+ Injured! Bombs Explode at Boston Marathon Finish Line 2 Dead, 100+ Injured! Two explosions shattered the finish of the Boston Marathon on Monday, sending authorities out on the course to carry away the injured while stragglers in the 26.2-mile race stopped altogether. The Boston Police Department reported that there are at least two people dead and at least 100 others injured, according to a report by the Boston Globe. Boston Police have also confirmed another explosion occurred at the John F. Kennedy Library. A law enforcement official says cellphone service has been shut down in the Boston area to prevent any potential remote detonations of explosives. The official was speaking on condition of anonymity because the investigation was ongoing. In a news conference, Boston Police Commissioner Ed Davis confirmed the explosions and provided security measures for Boston citizens. “Don’t go any place and congregate in large crowds,” Davis said. Davis also said the incident is an ongoing event and said it is unclear if the explosion at the JFK library is related to the two explosions at the finish line. Both Davis and Boston Gov. Deval Patrick expressed the necessity for tips and information from witnesses. The Boston Bombs Tipline can be reached at 800-494-TIPS, and to locate victims, the public can call 617-635-4500. Two high-level U.S. law enforcement sources said one or more bombs was responsible for the explosions. An intelligence official said that two more explosive devices have been found and are being dismantled near the scene. The explosions occurred as thousands of runners finished the 117th running of the Boston Marathon, with crowds watching and cheering at the finish line, with the clock reading at just over four hours. At least four people were being treated at Massachusetts General Hospital, and various media are reporting deaths. CNN reports that at least two are dead from the explosions. The New York Police Department has stepped up security around landmarks in Manhattan, including near prominent hotels, said Paul Browne, deputy commissioner of the NYPD. Competitors and race volunteers were crying as they fled the chaos. Bloody spectators were being carried to the medical tent that had been set up to care for fatigued runners. “There are a lot of people down,” said one man, whose bib No. 17528 identified him as Frank Deruyter of North Carolina. He was not injured, but marathon workers were carrying one woman, who did not appear to be a runner, to the medical area as blood gushed from her leg. 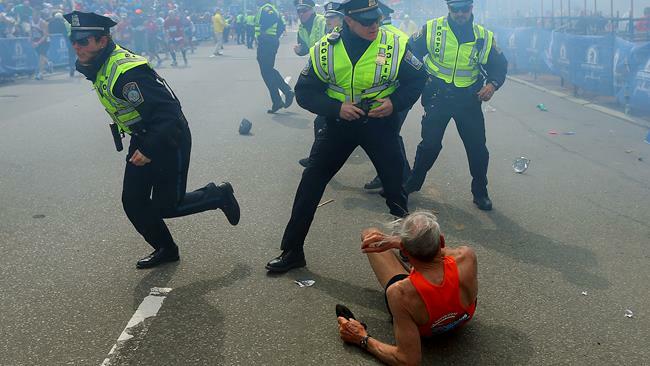 A Boston police officer was wheeled from the course with a leg injury that was bleeding. Neither race officials nor public officials could immediately estimate the number or degree of injuries. About three hours after the winners crossed the line, there was a loud explosion on the north side of Boylston Street, just before the photo bridge that marks the finish line. Another explosion could be heard a few seconds later. Smoke rose from the blasts, fluttering through the national flags lining the route of the world’s oldest and most prestigious marathon. TV helicopter footage showed blood staining the pavement in the popular shopping and tourist area known as the Back Bay. Cherie Falgoust was waiting for her husband, who was running the race. Runners who had not finished the race were diverted straight down Commonwealth Avenue and into a family meeting area, according to an emergency plan that had been in place. Smoke rose 50 feet in the air, Mitchell said. People began running and screaming after hearing the noise, Mitchell said. “Everybody freaked out,” Mitchell said. The White House says President Barack Obama has called Boston’s mayor and the Massachusetts governor to express his concern for those injured in the Boston Marathon explosions. Obama also told Mayor Tom Menino and Gov. Deval Patrick that his administration would provide whatever support was needed in responding to the incident, the White House said. The president was briefed on the explosions by Homeland Security adviser Lisa Monaco shortly after 3p.m. EDT. Vice President Joe Biden was on a conference call with gun control activists when staffers turned on televisions in his office Monday to view coverage of the explosions. Shortly after the explosions, Secret Service shut down Pennsylvania Avenue outside the White House, cordoning off the area with yellow police tape. Several Secret Service patrol cars also blocked off the entry points to the road. The White House was not on lockdown and tourists and other onlookers were still able to be in the park across the street from the executive mansion. The Hobbit Rules Box Office! Mutant Dog-Pig Found in Xinxiang City! Where is Planet X!!! Nancy Leider!! !